REDUCED! 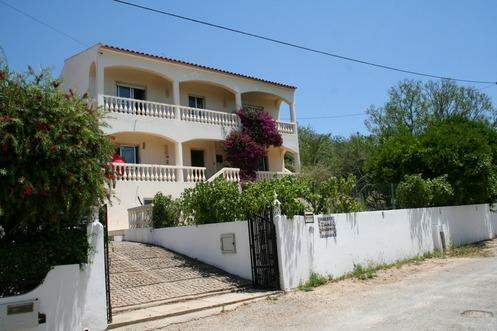 5 bed villa, Paderne - Property for sale. Full Description: In a peaceful location on the outskirts of the popular village of Paderne is this spacious 5 bedroom villa, just a few minutes walk to the village and all amenities and with wonderful countryside views this property would make an ideal permanent home or holiday residence. The main living accommodation is on 2 floors, each with independent entrance so can either be utilised as 2 separate apartments, as it is now, or could be adapted into one large house. On the ground floor is an entrance hallway, lounge/dining room with fireplace, fitted and equipped kitchen, 3 double bedrooms with fitted wardrobes, full bathroom and shower room. On the 1st floor you have the hallway, lounge/dining room, fitted and equipped kitchen with larder, 2 double bedrooms with fitted wardrobes and full bathroom. There are extensive open and covered terraces on all levels and off most rooms surrounding the whole property so you have sun all day and beautiful views. There is a gated area suitable for a dog run/kennel, tool shed, storage rooms, driveway with parking for 2 cars and a garage. The house sits on a decent sized fully enclosed private plot with plenty of room for a swimming pool if required and there are a variety of fruit trees, vines and flowering shrubs in the garden. The house is in good condition and decorative order, needs some updating but this is reflected in the very competitive price. Early viewing recommended.